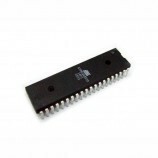 The high-performance, low-power Atmel 8-bit AVR RISC-based microcontroller combines 8KB ISP flash memory, 1KB SRAM, 512B EEPROM, an 7-channel/10-bit A/D converter (TQFP and QFN/MLF), and debugWIRE for on-chip debugging. 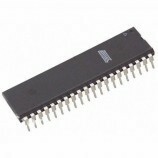 The device supports a throughput of 16 MIPS at 16 MHz and operates between 4.5-5.5 volts..
Operating Voltage: 4.5V to 5V. 32 x 8 General Purpose Working Registers. Up to 16 MIPS Throughput at 16 MHz. High Endurance Non-volatile Memory segments. 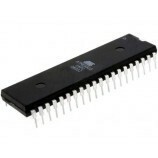 8 Kbytes of In-System Self-programmable Flash program memory. Write/Erase Cycles: 10,000 Flash/100,000 EEPROM. Data retention: 20 years at 85°C/100 years at 25°C(1). Optional Boot Code Section with Independent Lock Bits. 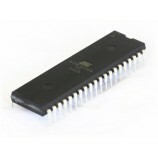 In-System Programming by On-chip Boot Program. Programming Lock for Software Security. 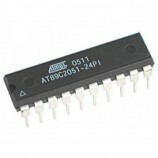 Programmable Watchdog Timer with Separate On-chip Oscillator. Minimal circuit required for a complete functional project. Projects requiring more than logical control for devices. 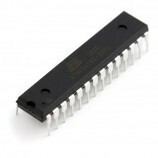 Microcontroller applications for multiple device interface/Control. Needs a USB AVR programmer. 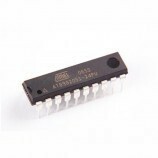 Also Searched as :atmega8 avr microcontroller,atmega8 datasheet,atmega8 arduino,atmega8 price india,minimal circuit.